Limewater, or kalkwasser (KW), is a very strong calcium saturated liquid solution that is added to reef tanks to replenish the calcium absorbed from the water by many marine organisms. Calcium is one of the essential elements in nature required by corals, crustaceans, mollusks, coralline algae and certain other calcareous forms of macroalgae to grow. By extracting calcium from seawater, they use it to build their skeletal structures from calcium carbonate. This is where alkalinity comes into play. Calcium alone is not enough because the availability of carbonate mostly depends upon pH and alkalinity. Skeletal growth can still take place if alkalinity is high, and the calcium concentration is much lower than that of seawater. However, if both are low, these calcareous animals and plants do very poorly and little growth occurs. The bottom line is that calcium, carbonate, pH, and alkalinity all relate to one another. To attain a thriving reef community, all of these elements apply, not just calcium by itself. Natural sea water has about 380 mg. of calcium per liter in it (380 mg/L). By adding a simple kalkwasser solution to an aquarium, this level can easily be maintained. The ideal calcium concentration level to strive for is about 400 mg/L. There are many factors to consider when determining how much KW to add to a reef tank. The size of the tank and what types of corals and marine life are maintained in it are just a couple. The calcium demand in a tank can vary and fluctuate with new coral growth, or when adding new live rock, corals, and other calcareous critters, so you will need to adjust dosage amounts and frequency when needed. First of all, use caution when working with any calcium compound in dry form, because they are somewhat caustic. You should not allow the dry powder to contact your skin, nor inhale it, and it should be kept out of reach of children. A limewater solution can be made by using a purified fresh water source, such as RO/DI or distilled water, and adding either calcium hydroxide (Ca(HO)2), or calcium oxide (CaO). Calcium chloride can also be used, but this calcium compound requires an additional step in buffering the solution with bicarbonate, which makes it a less desirable choice. Solution Mix: Most people add anywhere from 1 teaspoon up 1 tablespoon of calcium hydroxide/oxide to 1 gallon of water, but the well rounded 1 teaspoon equation is the amount suggested most often. The preparation and mixing of a KW solution are very important steps. If too much carbon dioxide is allowed to enter the mix, it causes calcium carbonate to form, which appears as an undissolved white residue (often called "snow") that settles to the bottom of the container. This cannot be used and will need to be removed from the solution and disposed of. Don't mix more than one gallon of solution at a time. Each time the container is opened and the solution is used, it gets exposed to more carbon dioxide, and more calcium is lost. 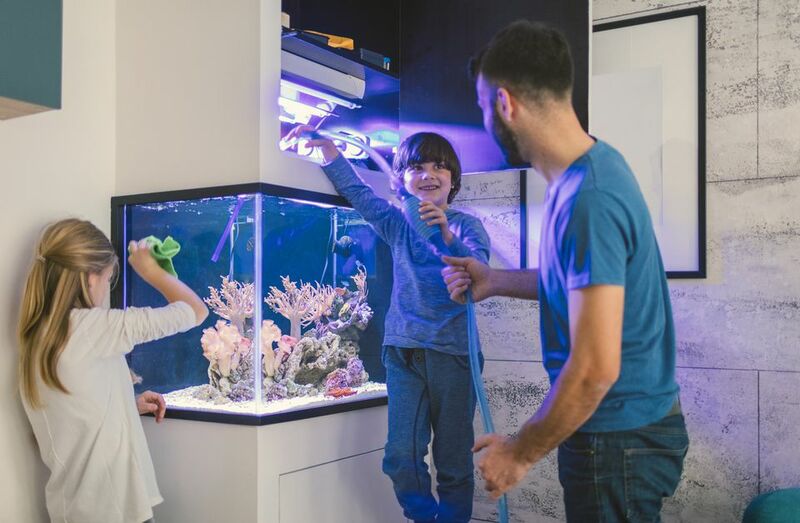 The introduction of a KW solution into an aquarium should be done slowly, never just dumped in, and there are several ways this can be accomplished. Add top-off water to the aquarium or sump to replace water evaporation. Use a slow-drip doser. Auto-dosers or metering pumps can be purchased, or you can choose to make your own simple slow-drip water top-off system set-up. A doser is also a good way to introduce nutritional supplements or other reef additives, such as iodine. While they may be a bit more expensive, if you don't want to go through all of the steps and trouble of mixing and adding kalkwasser or limewater to your aquarium, there are a number of calcium supplements that may work for you. Can You Use Untreated Tap Water in Aquariums?